"Heaven, By Hotel Standards" is a delightfully anecdotal and lavishly illustrated new book by author and photographer Susan Wilson. 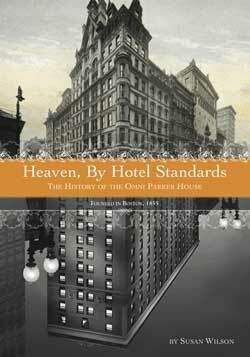 The Omni Parker House has played an integral role in the history of Boston since 1855. In the culinary world, it's been heralded as the home of the Parker House Roll and Boston Cream Pie--and a place where Ho Chi Minh, Malcolm X, and Emeril Lagasse once worked in the kitchens. It's where the brightest lights of America's Golden Age of Literature--writers like Emerson, Thoreau, Hawthorne, and Longfellow--regularly met in the legendary Saturday Club, where world-class musicians and theatricians have been inspired and nurtured, and where generations of local and national politicians assembled for private meetings, press conferences, and power breakfasts. "The Parker House book is magnificent -- visually and photos and text. All so entertaining. And i love all the colors and the quality of paper and the size, etc. Full of facts and smiles and life." No city in America can match the literary heritage of Boston. Just as the city has a Freedom Trail connecting its Revolutionary sites, it also has a Literary Trail connecting the homes, workplaces, and final resting places of its great writers. This revised second edition of Susan Wilson's expert guidebook (originally published 2000, ISBN 0-618-05013-2) brings the story up to the minute. 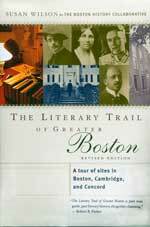 Spanning nearly four centuries of literary greatness, from Anne Hutchinson and Cotton Mather to Sylvia Plath and John Updike, The Literary Trail of Greater Boston covers more than just Boston proper, as the title suggests. Winding its way through Cambridge and finding its way to Concord, Wilson's work pays special tribute to literary heroes of the nineteenth century, including Alcott, Thoreau, Longfellow, Emerson, and Hawthorne, while guiding readers to sites related to Kahlil Gibran, Willa Cather, Robert Frost, Eugene O'Neill, E. E. Cummings, and a remarkable number of other modern writers. This unusual guidebook also features lively selections from the writers' own works along with short essays on writers past by well-known contemporary writers. These include Julia Child on Fannie Farmer, David McCullough on Francis Parkman, and Henry Louis Gates, Jr. on W. E. B. DuBois. 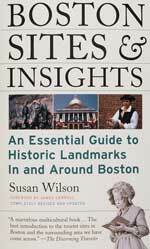 Whether you're looking for a history of one of the city's world-class museums or for a fascinating story about Boston's popular North End, Susan Wilson covers it all in Boston Sites and Insights. Divided into six sections that reflect the diversity of people, activities, and landmarks within the city, this fascinating book leaves no stone unturned. With practical, up-to-date information in an "Essentials" section at the end of each chapter as well as fresh retellings of popular legends and lore, Wilson provides everything the modern visitor or current resident needs to know to enjoy the multicultural city of Boston, Massachusetts. 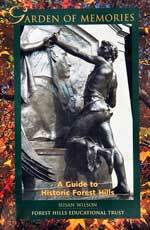 YOUR LOCAL BOOKSTORE -- You'll find Boston Sites and Insights in the Travel (local, or New England) or History section. or anywhere else you usually shop! Susan's beautifully written, lavishly illustrated, four-color book takes visitors on six themed walking tours through the largest, most beautiful rural garden cemetery and sculpture garden in America.